Mother's Day Jewelry - Personalized Jewelry She'll Love! Even if she can’t be with her children all the time, this elegant ring will help Mom keep them close with its creative design that honors a mother’s embrace. Crafted of solid sterling silver, it features up to 5 engraved names that are highlighted with 2 rows of sparkling crystals. Each name leads to a center band that tucks them together in a warm embrace. This brilliant ring houses a crystal birthstone for each beloved family member for a Mother’s Day gift that will take her breath away. Click here to see this ring in 24k gold plate. This stunning necklace is an excellent way to celebrate a mother’s love on Mother’s Day. 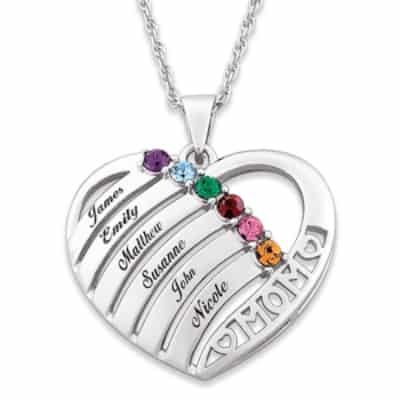 Elegantly sculpted along one side of the heart is the word, “Mom,” while the other side is filled with up to 6 names and their respective birthstones. 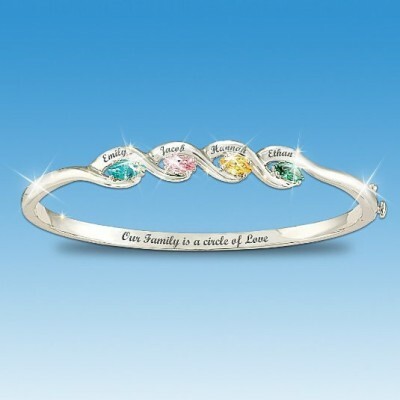 Thanks to its innovative design, the colorful Austrian crystal stones form a loving path that leads right back to Mom. Also available in gold – click here to view. While a casual glance at this exquisite ring provides a stunning view, a closer look reveals the infinity symbol cleverly incorporated into its design. 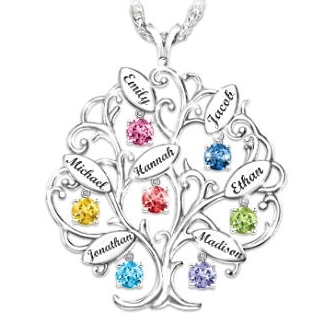 Sculpted of pure sterling silver with 18-karat, gold-plated accents, it houses up to 6 engraved names and their respective birthstones. 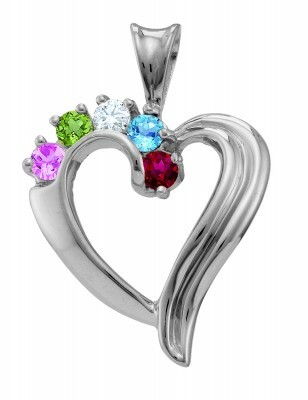 For a look that radiates love, each unique birthstone is elegantly enclosed within a heart-shaped setting. 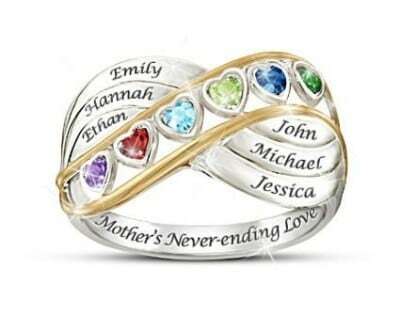 With the words, “A Mother’s Never Ending Love” engraved on its inner band, this Mother’s Day gift will leave her speechless. Expertly handcrafted from solid sterling silver, this necklace is charming in its simplicity. With hand-hammered round charms and tags to choose from, you can mix and match any 3 pendants to create a one-of-a-kind necklace. 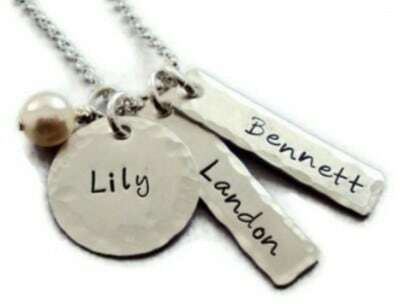 For a custom gift Mom will love, you can personalize the lightweight charms with any name, date or word. Polish it off with your choice of a Swarovski crystal or timeless pearl. Whether for Mom or Grandma, this monogrammed necklace features her initials carved out of its center for a look that is uniquely hers. 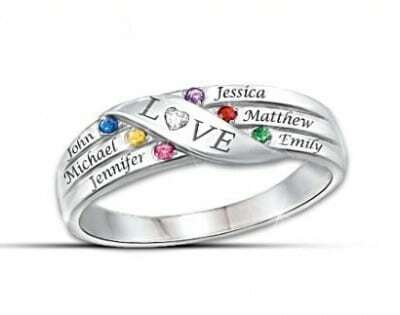 Crafted of solid sterling silver, her monogram is surrounded by a ring of love that features up to 4 names and their corresponding birthstones. Elegantly dangling from a 20-inch chain, this personalized piece will remain near and dear to her heart forever. 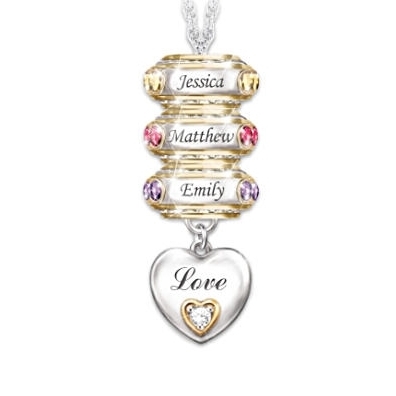 Rack up the love on Mother’s Day with this personalized pendant that features up to 6 round charms, each presenting the name and birthstone of a beloved family member. Plated with sterling silver, this necklace features Swarovski crystal birthstones and 24-karat gold accents. For a look that shows love is your family’s foundation, a simple silver-plated heart charm dangles below with “Love” on its front and “My Family, My Joy” on its back. For the Mom who appreciates life’s antiquated beauties, this unique ring is fashioned with a vintage style from genuine sterling silver and 14-karat yellow gold. To represent her loved ones, you can choose up to 4 heart-shaped stones to adorn its center. Protected with a tarnish-resistant finish, this antiqued ring will stand the test of time. 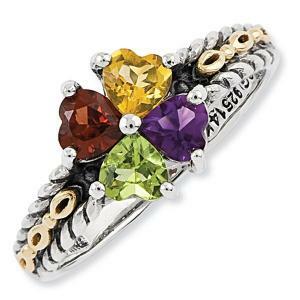 It comes embellished with up to 6 birthstone-studded waves that feature the engraved names of her loved ones. The sparkling cubic zirconia stones are sure to catch her eye and serve as a sweet reminder of her cherished family. 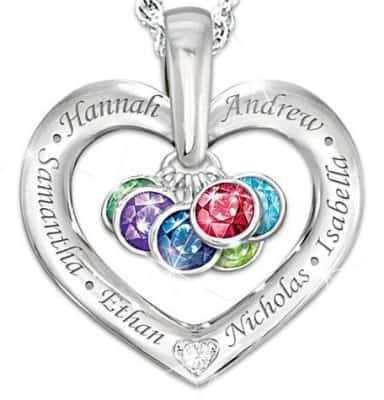 On this Mother’s Day, you can help Mom show the world the contents of her heart with this birthstone necklace that features her children at its core. Designed with a meaningful open heart, it shimmers with dangling birthstones for a look that shows her children are surrounded in love and forever protected therein. To polish off this piece, it houses a dazzling genuine diamond where the heart comes to a point. As a wearable reminder of the love her family shares, this personalized ring features a stunning 18-karat, gold-plated ribbon that weaves throughout the piece, tying it all together. Highlighted in the center of this exquisite design are up to 6 crystal birthstones that correspond to the beautifully engraved names on the band. The crystal-paved ribbon and sterling silver band come together to form a subtle infinity symbol, which proclaims the never-ending nature of her family’s bond. If you have a large family, here’s your chance to include them all. 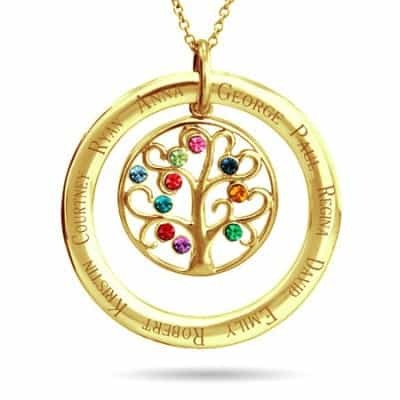 As an ode to your family tree, this creative necklace features a beautiful birthstone-studded tree, surrounded by a circle of love that is expertly engraved with up to 10 names. Composed of sterling silver, it is plated with a warm 14-karat gold vermeil for an impressive look that Mom will want to show off every day. View this necklace in sterling silver by clicking here. This exquisite ring gracefully illustrates that children are the center of their mother’s heart. 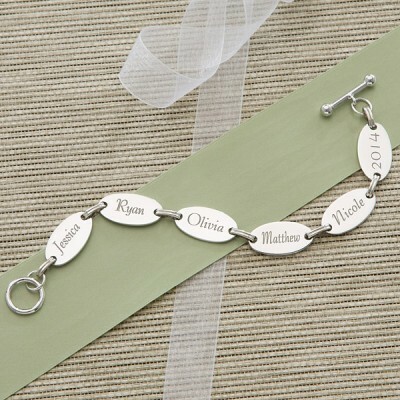 Onto a pure sterling silver setting, you can engrave up to 6 names to create a personalized gift Mom will love. 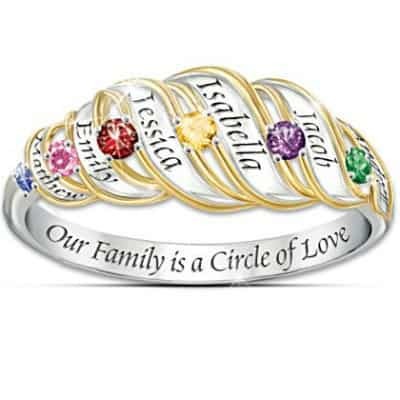 The ring’s center features a cluster of beautiful heart-shaped birthstones, one for each cherished child. This ring is also available in gold plate – click here for more information. 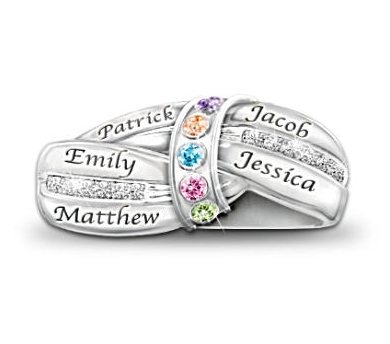 Help Mom stay connected to her family with this personalized bracelet that features 6 oval discs, each with a beloved name, date or word elegantly engraved on its surface. Skillfully crafted of hand-polished pewter, it provides a beautiful toggle closure for a gift that is sure to become a family treasure. Composed of genuine sterling silver, this captivating necklace highlights Mom’s children as the jewels that make her heart shine. As a perfect way to celebrate Mother’s Day, you can choose up to 6 expertly cut birthstones to represent each priceless loved one. In your choice of silver or gold, it comes gift packaged with a lightweight 18-inch cable chain for a comfortable design she’ll want to wear every day. Click here to see this necklace in gold. This personalized necklace features a double-heart design, where 2 hearts elegantly merge together to form one cohesive look. 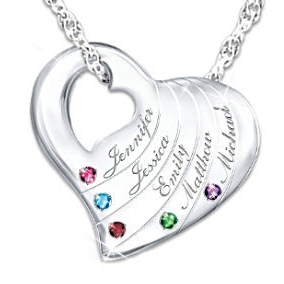 It features a sturdy, 1mm-thick construction that can be personalized with inlaid crystal birthstones on one heart and up to 5 engraved names on the other. With both silver and gold options, you can choose a style that caters to Mom’s unique tastes. Click here to see the necklace in gold.